Buck Knives was founded in San Diego by Hoyt H. Buck after he began a love affair with knives back in the early 1900’s. Today, the Company produces a wide array of high quality folding and fixed blade knives that are timeless in their design and superbly effective in the field. The knife industry changed overnight with the introduction of the Buck Model 110 Folding Hunter in 1964 as it became an instant classic. 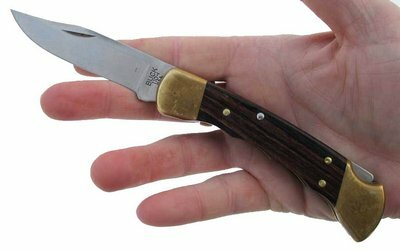 Almost 50 years later this classic lockback knife has stood the test of time and remains highly popular among huntsmen and general outdoor enthusiasts. The Buck 110 has stood the test of time for decades and remains a superb budget hunting knife today. Let’s face it, at 7.2 ounces the Buck 110 is anything but lightweight. It’s a rather heavy fellow and you’ll certainly know you’re carrying it but with this bulk comes reassuringly sturdy performance. It comes with a leather sheath that is obviously where you’re supposed to carry a knife with this amount of heft and it’s not really going to sit well in your pocket. This is certainly no EDC. The semi-hollow ground blade has a clip point shape and manufactured from 420HC stainless steel which has a high carbon content that improves corrosion resistance. Buck applies an impressive heat treatment to really bring out the best in this steel. A blade of this shape is really best suited to hunting and skinning and that was the clear intention when this knife was originally designed. The blade comes sharp out of the box but not as sharp as some of the more modern tactical knives with higher end steels such as 154CM or S30V. The handle consists of Macassar Ebony wood held together with quality brass bolsters and all the edges are nicely smoothed for comfort. Macassar Ebony is pretty rare these days and comes almost entirely from trees within remote areas of Indonesia. It’s typically used in high end furniture and expensive musical instruments so you won’t find this on many pocket knives and it highlights the type of rare quality found on a knife like this. In fact, given how scarce this wood is I suspect Buck will not be using it for much longer so that’s more incentive to buy one now! The Buck 110’s locking mechanism utilizes a rear lockback design that many knives of this type use after the introduction of the Model 110. Buck was the first company to really produce a lockback mechanism that worked so well. Many knife purists will tell you that this type of mechanism is not up to the same standard as some of the more modern types like liner or frame lock but in our opinion the lockback remains one of the strongest locking systems available and Buck does it well. Of course, any folding knife is never going to match the strength of a full-tang fixed blade but that’s a different story. A knife that stands the test of time like this has done so because it has earned the respect and trust of users in the field. A knife can look great on paper but the real test is how well it’s received by those who really count – outdoorsmen, military personnel, campers, backpackers and the like. That means all of you! What’s also great is that Buck makes a smaller version, the which is perfect for those who find the Buck 110 too chunky. See Buck 55 at Amazon. Make no mistake, this is not your modern day tactical yet there will always be a place for the Buck 110 in a world where people are using knives. Whether you’re a knife collector, enthusiast or simply someone who needs a solid knife for outdoor use than won’t break the bank then the Buck 110 is an unregrettable choice. The Good: Sturdy, super solid and well balanced. Great for hunting and skinning. Inexpensive. The Bad: A little heavy for some. Not great at holding its edge, needs maintenance to stay sharp. Bottom Line: A true classic hunting knife that’s built to last and performs well.